I was honoured this week to be asked to address the 16th session of the United Nations’ Commission on Science and Technology for Development in Geneva on the topic of Smarter Cities. I was invited to speak following the Commission’s interest in my article “Open urbanism: why the information economy will lead to sustainable cities“, which was referenced in their report “Science, technology and innovation for sustainable cities and peri-urban communities“. I’ll write an article soon to describe what I learned from the other speakers and discussions at the Commission; but in the meantime, this is a reasonable representation of my spoken remarks. In the Industrial Revolution European cities were built upwards around lifts powered by the steam engine invented by James Watt and commercialised by Matthew Boulton in Birmingham. Over the last century we have expanded them outwards around private automobiles and roads. We believed we could afford to base our cities and their economies on that model because its social and environmental costs were not included in its price. As our cities have become polluted and congested; as the world’s urban population grows dramatically; and as energy costs rise; that illusion is failing. Technology offers powerful opportunities to address those challenges, and to support the lives of populations inside and around cities in new and more efficient ways, in both developed and developing markets. But technology will only deliver those benefits if we adapt governance and financial models to achieve broader social, economic and environmental outcomes; and if we use technology in a way that serves the genuine needs of local people, communities and businesses. A city that succeeds in transforming itself in this way is one that we call a Smarter City. Those technologies are developing at an incredible rate. Two years ago, IBM’s “Watson”computer competed successfully against human beings in the television quiz show “Jeopardy”. Scientists at the University of California at Berkley have used a Magnetic Resonance Imaging facility to capture images from the thoughts of a person watching a film. And anything from prosthetic limbs to artificial food can be “printed” from digital designs. The boundary between information systems, the physical world, and human minds, bodies and understanding is disappearing, and the world will be utterly transformed as a result. As digital and related technologies develop ever more rapidly, they will continue to change the way that value is created in local and global economies. Existing challenges in the acquisition of skills, digital exclusion and social mobility mean that life expectancy varies by 20 years or more even between areas within single cities in developed economies, let alone between the developed and developing world. The challenge of digital exclusion is well known, of course; but the rapidity of these developments and the profound nature of their potential impact on city systems and economies imply a new sense of urgency in addressing it. When my son was two years old I showed him a cartoon on an internet video site using the touchscreen tablet I’d just bought. When it finished, he instinctively reached out to touch the thumbnail image of the cartoon he wanted to watch next. The children of my son’s generation who grow up with that innate expectation that information across the world is literally at their fingertips will have an enormous advantage. One of the things that we are exploring through Smarter City initiatives is how to make some of the power of these technologies more widely available to cities and communities. The city of Rio de Janeiro offers one example of what is possible when we successfully apply technology in cities. Under the leadership of Mayor Eduardo Paes a single operations centre for the city now coordinates the actions of 30 City services to manage the city safely and efficiently. 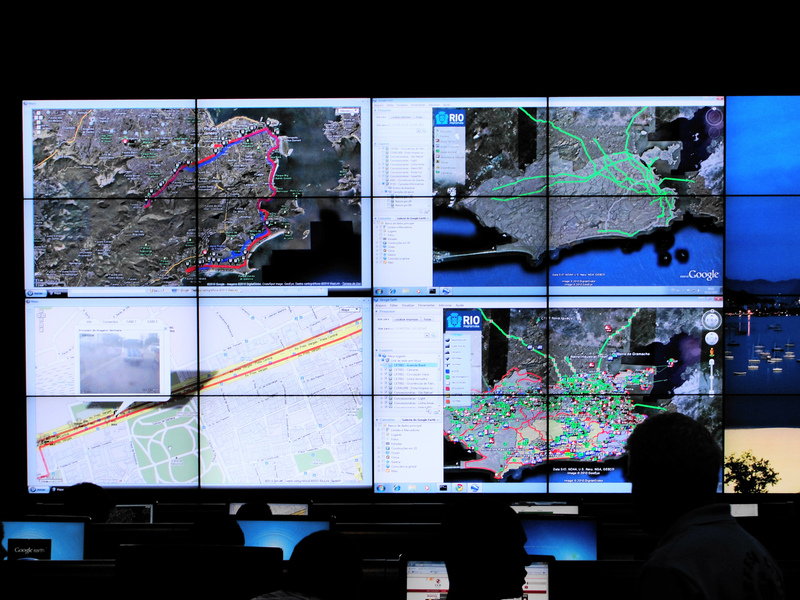 Information feeds from the city’s road systems, CCTV cameras, public safety services and from an advanced weather forecasting solution that can predict the likelihood of life-threatening landslides are delivered to the centre in realtime, and used to trigger multi-agency responses, as well as alerts to the civilian population through channels such as social media . But Rio is a large city in a rapidly growing Country; and it is preparing for a Football World Cup and Olympic Games within 2 years of each other. How can cities who are not in this position emulate Rio’s approach? And how can the power of this technology be made more broadly available to city communities as well as the agencies and institutions that serve them? In Dublin, Ireland, the “Dublinked” information sharing partnership between the City and surrounding County Councils, the National University of Ireland, businesses and entrepreneurs is now sharing three thousand city datasets; using increasingly sophisticated, realtime tools to draw value from them; identifying new ways for the city’s transport, energy and water systems to work; and enabling the formation of new, information-based businesses. It is putting the power of technology and of city information not only at the disposal of the city authority and its agencies, but also into the hands of communities and innovators. But Dublin is the capital city of a developed country, with an internationally-recognised university, and which hosts large development and research facilities for multi-national technology companies such as IBM. How can cities without those advantages emulate Dublin’s successes? One way is to re-use the results of research and “first-of-a-kind” projects whose cost has been borne in the developed world or in rapidly growing economies to pilot solutions in the developing world. For example, my colleagues recently used knowledge gained through research in Dublin to suggest improvements to public transport in Abidjan, Cote d’Ivoire. The project analysed anonymised movement data from the GPS sensors in the mobile telephones of bus passengers in order to identify clusters of start, end and intermediate points in their end-to-end journeys. By comparing existing bus routes to those points, the project identified four new bus routes and led to changes in many others. As a result, 22 routes now show increased ridership. And by providing bus routes that better match the journeys that people really want to undertake, the need for them to travel to and from bus stops – often using unregulated and relatively unsafe “informal” travel services – is reduced to the extent that citywide travel time has decreased by 10%. But we are not just seeking to replicate what works in a handful of high-profile cities as if the same solutions apply everywhere. It’s not always the case that they do, especially without local adaptation. And it’s vital to also enable new initiatives that arise from specific local contexts in cities everywhere, whatever their resources. Consequently, in Sunderland, we were asked by the City Council: how do you make Hendon Smarter? Sunderland is typical of the many post-industrial cities in Europe that are rebuilding economies following the decline of industries such as coalmining, bulk manufacturing and shipbuilding in the late 20th Century. Hendon in Sunderland’s East End is one of the areas that suffered most from that decline, and it still has low levels of employment, skills and social mobility. What we have learned in Sunderland and elsewhere is that it is often private sector entrepreneurs and community innovators who have the widest set of ideas about how technology can be used cleverly to achieve the outcomes that are important to their cities, particularly in an environment with limited access to finance, skills and technology resources. The large institutions of a city can assist those innovators by acting as an aggregator for their common needs for such resources, making them easier to acquire and use. They can also introduce external partners with research and development capability to those aggregate needs, which for them can represent a new market opportunity worthy of investment. It’s rare that these connections work directly: government bodies and their large-scale suppliers have very different business models and cultures to small-scale innovators; and often there is little history of interaction, cooperation and trust. The role of “bridging organisations” and networks between individuals is extremely important. In Sunderland, Sustainable Enterprise Strategies, who provide business support to small businesses and social enterprises in Hendon, provided the bridge between the City Council and IBM; and community innovators, such as Lydia’s House who train vulnerable adults in skills such as furniture-making, and Play Fitness, who engage children from deprived backgrounds in physical exercise and education by using digital technology to connect exercise equipment to computer games. Sunderland Software City, the city’s technology business incubator, plays a similar role within the local community of entrepreneurial technology businesses. This approach is not specific to Sunderland, the UK or the developed world. 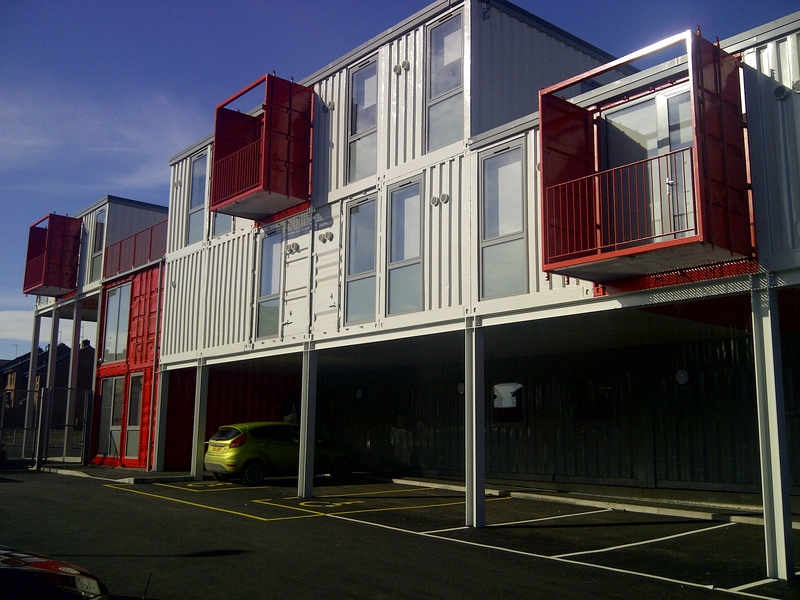 Our work in Sunderland was inspired by a previous project in Wuxi, China; and in turn it has informed our approaches in cities as far afield as the United States, the Middle East, Africa and Asia. Social Enterprises such as Lydia’s House and Play Fitness, which develop financially sustainable business models, but which are optimised to deliver social, environmental or long-term economic benefits, rather than the maximum short-term financial return. New partnerships between public sector agencies; educational institutions; service and technology providers; communities; and individuals – such as the Dubuque 2.0 sustainability partnership in where the city authority, residents and utility providers have agreed to share in the cost of fixing leaks in water supply identified by smart meters. Often such organisations create innovative business models in the form of marketplaces in industries in which money-flows already exist. The changes to those money-flows created by smarter systems form the basis of the potential for returns upon which a business case for investment can be made. Arguably, the widespread use of mobile phone technology in the developing world, and in particular the ubiquity of mobile payments systems in Africa, is more advanced in its ability to create such marketplaces using very low cost infrastructure than in communities in the developed world . Both financial services institutions and technology entrepreneurs in the West are watching these innovations closely and learning from them. Examples include SMS for Life, which uses a text messaging system to implement a dynamic, distributed supply chain for medicines between collaborating pharmacies in several African countries. And Kilimo Salama provides affordable insurance for small-scale farmers by using remote weather monitoring to trigger payouts via mobile phones, rather than undertaking expensive site visits to assess claims. This is a good example of a private-sector aggregator – in this case an insurer – investing in a technology – remote weather monitoring – to serve a large number of end-users – the farmers – who can’t afford it directly. In cities, we are starting to see these ideas applied to the creation of food distribution schemes; sustainable transport systems that share the use of resources such as cars and vans and perform dynamic matching between networks of independent consumers and providers of transport services; and many other systems that reinforce local trading opportunities and create social and economic growth. But the role of technology in these markets is not just to introduce consumers and providers of services to each other; but to do so in a way that informs consumers about the impact of the choices they are about to make. In Singapore, algorithms are used by the city’s traffic managers to predict traffic flow and congestion in the city up to one hour ahead with 85% accuracy. This allows them to take measures to prevent the predicted congestion occurring. In a later project in California, those predictions made by those algorithms were provided to individual commuters in San Francisco’s Bay Area. Each commuter was told, in advance, the likely duration of their journey to the city each day, including the impact of any congestion that would develop whilst their journey was underway. This allowed them to make new choices: to travel at a different time; by a different route or mode of transport; or not to travel at all. And we can appeal not only to individual motivations, but to our sense of community and place. In a smart water meter project in Dubuque, households were given information that told them whether their domestic appliances were being used efficiently, and alerted to any leaks in their supply of water. 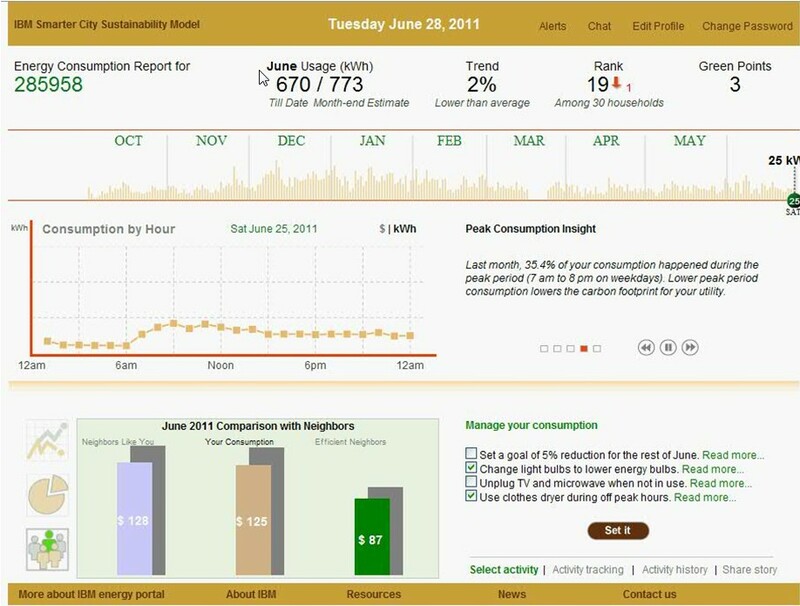 To a certain extent, households acted on this information to improve the efficiency of their water usage. However a control group were also given a “green points” score telling them how their water conservation compared to that of their near neighbours. The households given that information were twice as likely to take action to improve their efficiency. Maslow’s hierarchy of needs tells us that once the immediate physical needs and safety of ourselves and our family are secured, that our motivations are next dictated by our relationships with the people around us – our families, communities and peers. Our ability to relate information to community contexts allows information-based services to appeal to those values. A new style of personal leadership can be found in many of the situations in which these ideas are successfully applied: people from a variety of backgrounds who have the ability to build new bridges; to bring together the resources of local communities and national and international institutions; to harness technology at appropriate cost for collective benefit; to step in and out of institutional and community behaviour and adapt to different cultures, conversations and approaches to business; and to create business models that balance financial health and sustainability with social and environmental outcomes. The more that national and local governments can collaborate with the private sector, bridging organisations and communities to encourage this style of leadership and support and reward these new models of business, the more successfully we’ll put the power of technology into the hands of the people, businesses and communities most able to design, use and operate the new services that will make their cities better. Large organisations have resources; small organisations have the ability to create valuable innovations in true sympathy with the detail of their local context. Private sector has the expertise to invest in assets that create future value; public sector has the responsibility to govern for the good of all. It is only by working together across all of these boundaries at once that we will really succeed in making cities Smarter in a way that is sustainable and equitably distributed. And that must be the only definition of “Smarter” that makes sense.